I have an amazing recipe for Sherry Wine Cake and I figured that was a great place to start for an eggnog loaf cake. This is actually a very similar tasting cake and I love the simplicity of starting with a box cake mix....my favorite thing! This loaf cake would make the perfect gift for a teacher, neighbor, or hostess during the holiday season. Preheat oven to 350 degrees and spray 2 - 8 x 4 loaf pans with cooking spray. In the bowl of a stand mixer place all your ingredients for the cake and mix on medium for 2 minutes. Pour into the greased loaf pan (s) and bake for 40 - 50 minutes or until a toothpick inserted into the center comes out clean. Let cool in pans about 5 minutes then remove to a plate or cooling rack. To make glaze place the powdered sugar in a bowl and add the eggnog. Whisk until smooth adding more powdered sugar or eggnog until it is the consistency you like. I always start with MOST of the liquid then add more if it needs more. Using the whisk drizzle the glaze over the loaves and set aside until the glaze firms up a bit. Slice and serve. Mmmm mmmm! 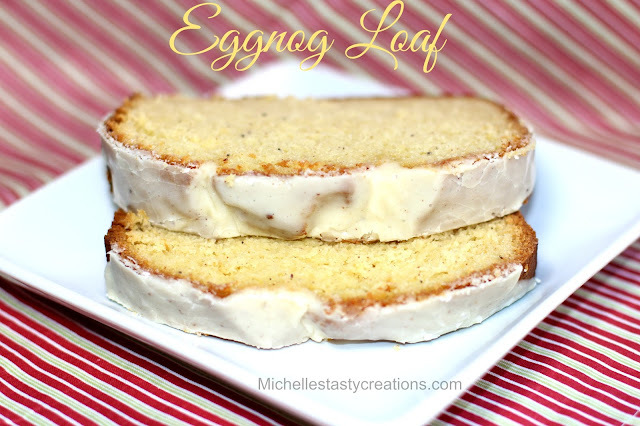 A delicious holiday treat for breakfast or dessert!